John Bauer will tread a thin beauty and discord. 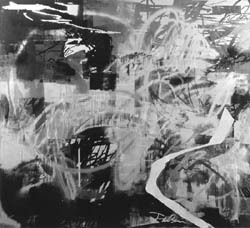 Content of his repeated gestures combined as veneers referring to the description, as if condensing multiple film images into a single overall composition. 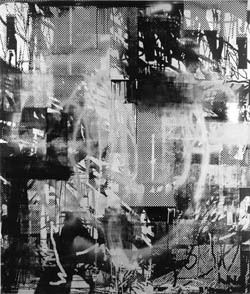 Without reference to the external environment as much as internal psychological state, Bauer uses monochromatic palette associated with photography and the pixilated effect on the print media to heighten Sense of Virtuality and information overload. 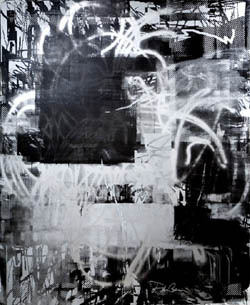 His images are full of frenetic, apocalyptic energy reflective urban experiences. Despite the intense vivacity Bauer’s fabrics are piercingly harsh one. Was carried out only in a palette-gloss and matt black and metallic silver, Bauer’s paintings have introduced the elegance of the flat surfaces of the label is encoded within the glamor of the industrial design and holographic shine of futurism. 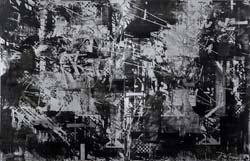 Bauer through a densely stacked models, translucent layers, and an emotional journey, an impersonal characteristics of digitized imagery and his detached processes work to get the unique subjectivity of infusing a seamless and generics with the contemplative aura of personal consultations. Merging real meanings of abstraction, the reproducibility of pop, and graphicness design, John Bauer’s canvases set up airplanes using the visual language of folds, confusing and should be re-fragmented, contradictory compositions. 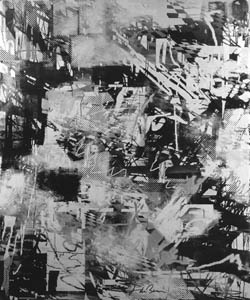 Beginning each painting is a low-technology, computer drawing, Bauer develops his work through the complex process includes hands-off painting techniques such as stenciling, silk-screening and spraying digitized graphics that turn towards the sublime picturesque areas abstraction.